Measuring your vertical jump is quite simple. 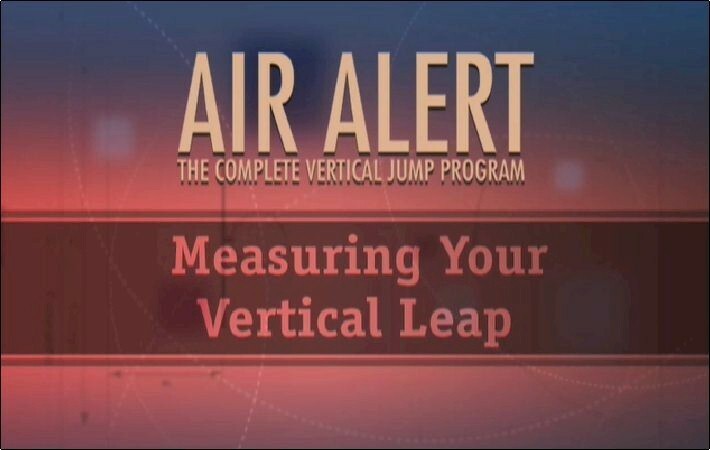 Measure your current vertical leap and record it on the Air Alert® Vertical Jump Measurement Chart prior to starting the program. To measure your vertical jump, stand flat-footed next to a wall, reach high up into the air and make a mark on the wall with a piece of tape or chalk. Next, take one step and jump off both legs hard into the air making another mark as high as you can reach above the first mark. Measure the distance between the two marks. The measurement between the two marks will be your current vertical jump. Make about 5 measurements and record the highest one. Measure your vertical jump on the measurement chart at the beginning of each week. Do this after you have warmed up and stretched.